It is known that silver gets tarnished after being used for some time, and this makes silver jewelry require a lot of attention and care. It is possible to clean silver jewelry at home using techniques that require just few tools. The method that is used to clean the sterling silver jewelry in the house is simple. The first thing to do is to collect all the ingredients that are needed for the cleaning. The necessary ingredients are baking powder, salt, water and an aluminum plate. These are things that are commonly used for the household chores hence it is effortless to collect them. Once the ingredients are in place, put a tablespoonful of baking powder and salt onto the plate, add some lukewarm water to the plate and stir it until the mixture of baking powder and salt gets dissolved. Place the silver in the solution for a moment. Ensure that you do not use boiling water as that might end up causing damage to sterling silver jewelry. The time that the silver takes before losing the black stains will depends on how it was tarnished in first place. If it was very tarnished, it will need a lot more brushing. You should use a brush that has soft bristles and run it gently on silver for around ten minutes after it has been immersed in the solution that was prepared earlier. When cleaning jewelry that is plated with silver, the brushing should be minimum and done gently in order to prevent the scraping off of silver plating. This method should not be used when cleaning the antique silverware, as it could have been oxidized to have the vintage look. Putting it in a concoction that has salty water will make the oxidization peel off. 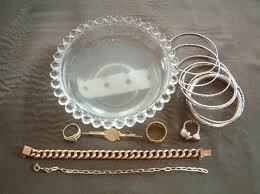 The other affective way of cleansing silver jewelry is by using toothpaste. A gentle layer of the toothpaste should be applied on silver followed by scrubbing for about a minute. After the scrubbing, the silver should be washed using lukewarm water and then wiped with a clean towel. After the cleaning, it will get its shine back. When drying the sterling silver jewelry, it is important to choose the right cloth material. The cloth that is used should be 100 percent cotton like sweat shirts and T-shirts. The other materials that can be used for drying are cotton balls, silver materials or soft flannel material that is unbleached.